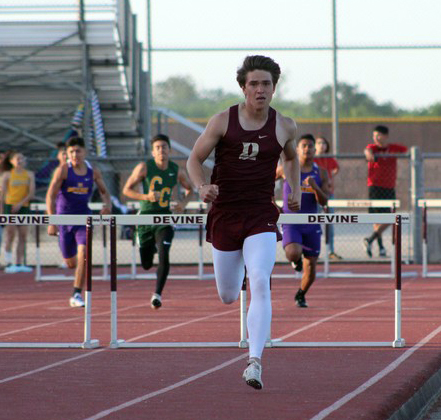 Devine’s varsity track team netted the second District 29-4A championship of the day as the Warhorses beat second place finisher Hondo 210 to 142. Head Coach Lon Cozby won his first championship as a head coach a few minutes earlier as the Arabians won the title over second-place Pearsall. Eighteen Warhorses move on to Area at Warhorse Stadium on Wednesday, April 17. In order to qualify, participants must have finished in the top four in their event. 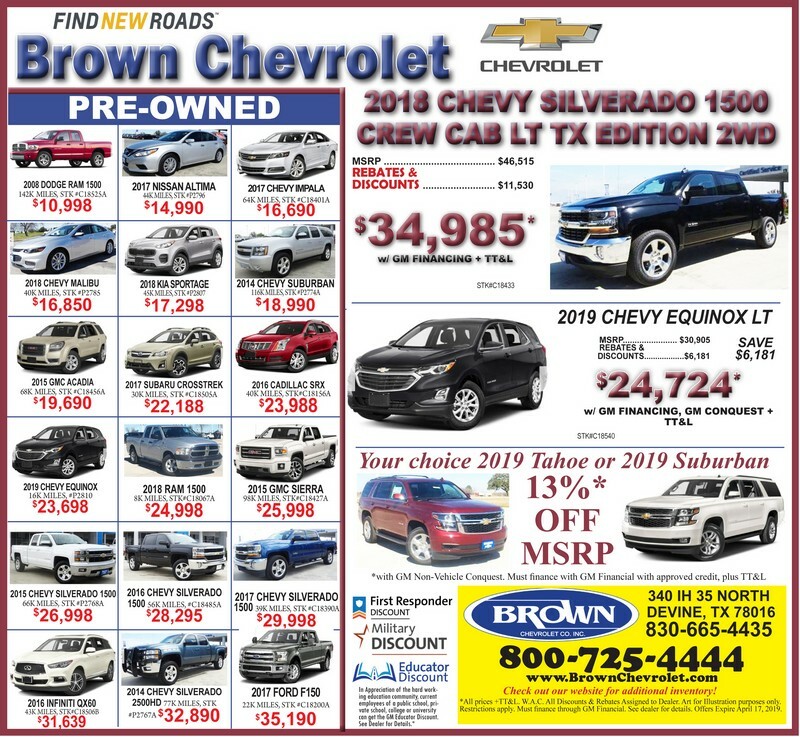 In no particular order, those qualifying for Area are Isaiah Oropeza, Joey Seguin, Donavon Camacho, Jayce Hackebeil, Xavier Garza, Guido Zapata, Christian Gerlach, Grant Collins, Xsavior Martinez, Brady Hackebeil, Justin Contreras, Tristan Ortiz, Tanner Hardcastle, Truett Barron, Dakota Wofford, Damian Martinez, Brady Cardenas, and Jacob Featherly. Sounds like they truly incorporate the motto that goes around other Warhorse sports…Whatever It Takes! Overall, it has been a great, fun and exciting season with these amazing athletes. The season continues for Joey Seguin and Jacob Featherly as they earned a chance to compete in Area. The vaulter work hard every do to improve and try to set PRs. Jacob set a new PR and School Record while winning Pole Vault at 13’3 while Sequin finished in second place with a height of 11’0. Zachary Alvarez finished in fifth place with a height of 10’0”.—Pole Vault Coach Hannah Thompson. Justin Contreras, first in Long Jump, fourth in Triple Jump—It is an honor to go to Area for my second year in a row, and to go as a district champion feels even better. On a side note, Justin was in fourth place going into his final attempt in Long Jump. He jumped one-inch further than his previous PR to win gold in the event. Team standings: 1st-Devine-210, 2nd-Hondo-142, 3rd-Carrizo Springs-120, 4th-Crystal City-77, 5th-Pearsall-64. Guido Zapata took 1st in the 100M and 300M Hurdles to advance to Area. Click here for more photos from the District track meet! Top 4 advance to Area Meet in Devine on Wednesday, April 17: 100m Dash—1st-Josh Carrizales-Carrizo Springs-11.45, 2nd-Isaiah Oropeza-Devine-11.667, 3rd-Gerardo Jaime-Carrizo Springs-11.668, 4th-David Patrino-Crystal City-11.718, 5th-Bobby Spicer-Devine-11.719, 7th-Chad Lawson-Devine-12.04 200m Dash—1st-Austin Garza-Reyes-Carrizo Springs-23.18, 2nd-Sean Bosquez-Carrizo Springs-23.52, 3rd-Kolten Lentz-Hondo-23.64, 4th-Joey Seguin-Devine-23.8, 5th-Oropeza-Devine-23.95, 6th-Brady Hackebeil-Devine-23.96 400m Dash—1st-Donavon Camacho-Devine-51.77, 2nd-Lentz-Hondo-51.94, 3rd-Jayce Jackebeil-Devine-52.63, 4th-Josiah Peralta-Pearsall-53.66 800m Run—1st-Eduardo Serna-Crystal City-2:02.96, 2nd-Kutter Karnes-Carrizo Springs-2:05.7, 3rd-Joseph Ontiveros-Hondo-2:08.9, 4th-Zaine Leal-Pearsall-2:09.59, 7th-Chris Ortiz-Devine-2:13.44, 8th-Zackariuh Bocanegra-Devine-2:14.0 1600m Run—1st-Angel Rodriguez-Hondo-4:41.28, 2nd-Serna-Crystal City-4:43.33, 3rd-Devin Robles-Pearsall-4:45.38, 4th-Xavier Garza-Devine-4:47.3 3200m Run—1st-Robles-Pearsall-10:14.79, 2nd-Rodriguez-Hondo-10:16.19, 3rd-Leal-Pearsall-10:25.63, 4th-Serna-Crystal City-10:27.86, 6th-Garza-Devine-10:45.17, 7th-Ortiz-Devine-10:53.12 110m Hurdles—1st-Guido Zapata-Devine-14.56, 2nd-Christian Gerlach-Devine-17.14, 3rd-Trey Dickens-Hondo-17.36, 4th-Garrett Koch-Hondo-17.46 300m Hurdles—1st-Zapata-Devine-40.59, 2nd-Dickens-42.46, 3rd-Koch-Hondo-42.89, 4th-Gerlach-Devine-44.37 Long Jump—1st-Justin Contreras-Devine-20’6”, 2nd-Josh Carrizalez-Carrizo Springs-20’2”, 3rd-Jasiah Vaquera-Pearsall-19’11¼”, 4th-Garza-Reyes-Carrizo Springs-19’8”, 7th-Damian Martinez-Devine-18’10”, 8th-Brady Cardenas-Devine-18’3 ¾” Shot Put—1st-Tristan Ortiz-Devine-49’3¾”, 2nd-Tanner Hardcastle-Devine-44’5”, 3rd-Austin Porter-Hondo-43’7”, 4th-Truett Barron-Devine-43’3¾” Discus—1st-Porter-Hondo-156’3”, 2nd-Dakota Wofford-Devine-145’7”, 3rd-Michael Cuevas-Crystal City-134’0”, 4th-Armando Rodriguez-Carrizo Springs-131’8”, 5th-Evan Priest-Devine-128’9”, 6th-Ortiz-Devine-123’8” Triple Jump—1st-Gage Crisp-Hondo-42’4½”, 2nd-Vaquera-Pearsall-42’1½”, 3rd-D. Martinez-Devine-40’6”, 4th-Contreras-Devine-40’4”, 8th-Gehrig Runyan-Devine-35’4” High Jump—1st-Keldon Runnels-Hondo-6’0”, 2nd-D. Martinez-Devine-6’0”, 3rd-Cardenas-Devine-5’10”, 4th-Vaquera-Pearsall-5’10”, 6th-Contreras-Devine-5’6” Pole Vault—1st-Jacob Featherly-Devine-13’3” (DHS record), 2nd-Seguin-Devine-10’6”, 3rd-Hunter Delgado-Crystal City-9’6”, 4th-Bradley Perez-Carrizo Springs-9’6”, 5th-Zachary Alvarez-Devine-9’6”. Relays: 4x100m—1st-Carrizo Springs-43.76, 2nd-Devine-Oropeza, B. Hackebeil, Grant Collins, Xsavior Martinez-43.83, 3rd-Crystal City-45.52, 4th-Hondo-45.64 4x200m—1st-Carrizo Springs-1:31.62; 2nd-Devine-Oropeza, B. Hackebeil, Collins, X. Martinez-1:32.43, 3rd-Hondo-1:35.92, 4th-Crystal City-1:37.4 4x400m—1st-Devine-Camacho, X. Martinez, J. Hackebeil, Collins-3:28.73, 2nd-Hondo-3:35.64, 3rd-Crystal City-3:36.32, 4th-Carrizo Springs-3:39.43.